As an appraiser for nearly 30 years, and in the auction industry for 28 of those years, I have met with countless jewellery owners. The perceptions that these people expressed about the pieces they own is, more often than not, out of sync with the reality of the piece. If their jewellery is old they usually figure the age based on family hearsay. Often the information or anecdotes passed down are wildly inaccurate. As an expert who knows how to accurately date jewellery, I am always fascinated to listen to those tales, which typically offer more insight about the client than about the jewels. But occasionally, their story is accurate enough to contribute to my own perception of the age of a piece. This allows me to adjust the circa date slightly after examining the clues in the item to see if the evidence matches more closely their recounting of the facts. Quality is another area where perception conflicts with reality. 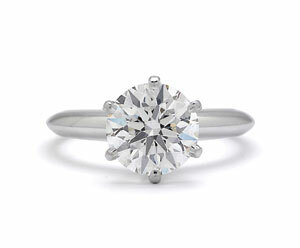 For example, the client will say the diamond is a perfect stone. After looking closely and realizing it is about G-VS, I ask how they came to that particular conclusion; they usually say that a jeweller or appraiser told them it was perfect. Invariably, such a client either doesn’t have that appraisal anymore or they explain it was simply a verbal opinion. Sometimes they will admit their grandmother, who previously owned the piece, told them it was perfect and, therefore, it must be. To many clients, quality is somehow directly related to the wealth or lifestyle of the previous owner in the family. Value is a big issue. Here, there is lots of room for wildly inflated perceptions. I have often heard owners of antique jewellery say that they were told that their appraisal was a replacement-value only and did not take the antique value into account. Certainly, an appraiser may say this, meaning the article could only be replaced with a version using new materials. But if the mindset of the owner is such that she wants to sell it, she may easily interpret this to mean she could sell it for much more than the appraised value. Of course, appraisers are well aware this is never the case. 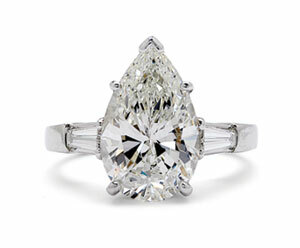 Pear-shaped diamond ring, 4.06 carats, H/VVS1 (GIA-certified). Sold for $66,000 at auction in Dec. 2007. Retail value $140,000;Appraised value $168,000. Round diamond ring, 2.32 carats, G/VS1. Sold for $29,000 at auction in June 2007. Retail value $60,000; appraised value $74,240. Jewellery auctions have had a vast influence in raising awareness of the old styles. The allure of art deco jewellery took root in the 1980’s when auction companies highlighted them in their catalogues and marketing materials; demand grew from there. This also brought more pieces out of safe deposit boxes and into the market. Yet the value of these pieces has not increased any more then the rate of increase for contemporary jewellery. This the case since, for the most part, auction values relate to the replacement value as established by appraisers. Referring to the chart on this page, the benchmark for retail value is established as 100 percent, while the replacement value is anywhere up to 25 percent greater. The reasons for this are many, but the most common is that to replace an item with like materials and craftsmanship would necessitate a search for gems of matching size and quality. Also, design and labour may not be as easy to reproduce as the original since the piece would have been created from the gems at hand or those available to the original manufacturer. This replacement value is a little greater for period jewels. It is interesting to note that, within reason, period jewels can be replicated. above wholesale values. The only exception to this is when the piece is signed. In this case, period pieces can sell far above replacement value. Cash value can vary from 10 to 25 percent of the benchmark. There are several reasons why cash value is below auction value. The most common is that the jewellery buyer does not have to compete with other purchasers. By buying it outright, he is also giving the seller the added benefit of not having to wait for the auction process, which could take three to six months. Some appraisers visit an auction house to inspect jewellery about to be sold. This is an excellent way to gain knowledge of market values. In the international auction industry, this is known as ‘marking a sale’. The appraiser may request a private viewing where he can sit at a table with his equipment to examine a selection of lots. This can move along quickly since he is usually given access to the catalogue descriptions, as well as condition reports for each piece. He notes the price range he expects the item will fetch at the auction. Ideally, this should be done without being influenced by the estimate of the auction house. With practice, it should be possible to predict, within 20 percent most of the time. Such diligent appraisers usually become regular auction buyers. With their knowledge, they are able to resell the jewellery to dealers who are less knowledgeable and consequently hesitant to buy directly from auctions. Other appraisers with limited financial means will work on commission for one specific dealer. In any case, it is an empowering practice to say the least.